The second half of the fifth season of Hit Me with Your Best Shot, the most glorious and playful audience participation event spearheaded by Nathaniel of the Film Experience, happen to arrive right in the middle of the month that DC has declared to be Batman’s 75th birthday. Accordingly, Nathaniel chose a particularly wide-open Batman-themed subject. In short: there have been, between 1966 and 2012, nine feature films starring the Caped Crusader. Participants are to pick their favorite single shot from any one of those movies – or, I guess, from all nine of them, for anybody with that kind of death wish. In the film, there’s a good break before the third variant of that image, the one that’s my actual pick for Best Shot, so we’re going to go ahead and take that same break now, while I explain my reasoning. Basically, we have here an exceptionally pure example of the motion picture attempting to copy the visual vocabulary of a comic book, something that happens almost never at all in comic book movies, weirdly (or not weirdly at all, actually: Ang Lee tried to do it in Hulk, fucked up, and now everybody’s scared of it). The use of images that echo one another is one of the most effective building blocks in the comic artist’s toolbox – an entire issue of the medium-defining Watchmen was built on the principle, and I would have to imagine that it long predates Dave Gibbon’s excellent work there. I’m certainly not a comic expert, but I know a thing or two about how images in juxtaposition create meaning, and I think the reason this technique works is because it’s a terrific way of guiding the eye and directing the reader’s thought process. 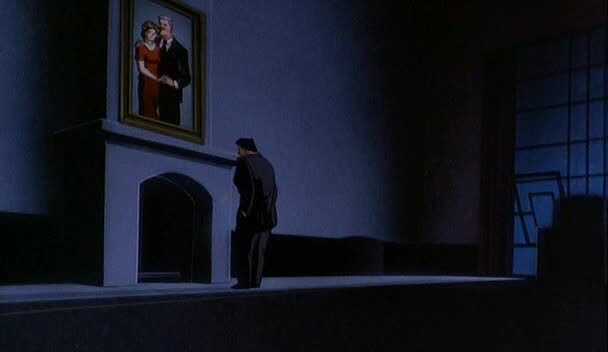 Take those two shots – even totally divorced from any knowledge about the tragic boyhood of Bruce Wayne, it’s really clear that the first image is setting up a mournful tone (crushing blues and blacks, silhouettes, the man dwarfed by the painting of the people), that we’re meant to continue reading into the second image, even though it’s not remotely so gloomy. The mere fact of the graphic match clues us in to two things: one is that the people in the painting are the people below the marker, the other is that the man in mourning has a pervasive, ritualistic attachment to the grieving process – a shift of time and place has left him in exactly the same place relative to the people he has lost. He is visually defined by his place in the grieving process. So keep that in mind as we head over to third iteration, my Best Shot. The important bit first: this isn’t a great image simply because it completes a trio, or because it is informed by the progression of the other shots. Certainly, that gives it a great deal of added impact, and if the color wasn’t enough to give this an exhausting, mournful tone, the way it taps into the feeling of those early images would definitely push it over the edge. But that’s hardly all of it. Forming emotional connections between images is one thing, and it’s a good thing, but what the repetition also does is to make us familiar with this composition. When it arrives for the third and most dramatic time, it feels like we’ve already seen it, because in a very real sense we have. And that – showing us something for the first time that triggers the feeling that we have seen it, that we have always been seeing it, that it is bigger than just this one moment – is what makes an image iconic, and iconic images are the very life’s blood of superhero comics. It is not a subtle genre at all: it is heightened, self-mythologising pulp, and it needs to register with immediate, visceral impact. The superhero image lands all at once, imparting its meaning, its emotion, and its celebration of the larger-than-life figure within it on a level that the gut perceives before the mind can sort out what’s going. So what is immediately, essentially Batman? What one concept about this character must land with the most impact if his entire existence is to make any sense? He lost his parents and has spent his adult life dressed as a bat to punch the evil out of the world and expunge himself of his grief over that loss. 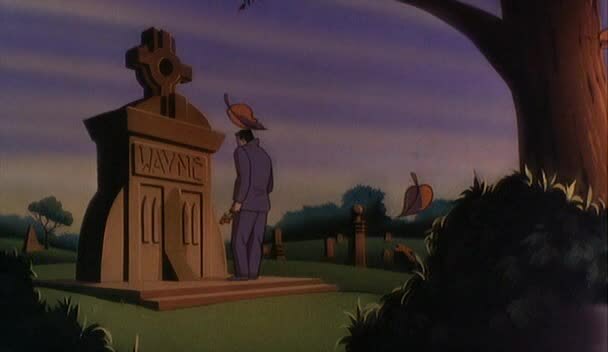 So, Batman, standing in front of their grave, a black form even against grim storm clouds, his shadow falling over the marker above his parents and obscuring the family name – cue the old bit about how Superman is really Clark Kent, but Bruce Wayne is really Batman. His new identity blots out the old one; and this too is a reason to mourn. 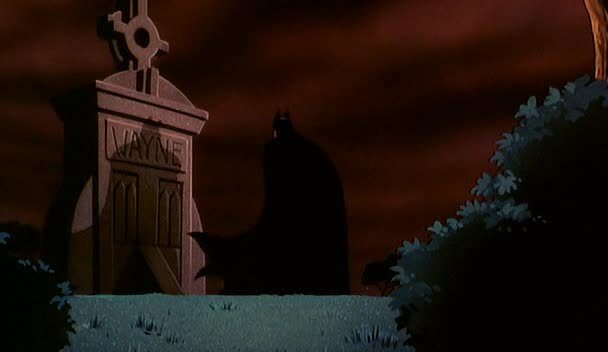 So there it all is, the essential core of Batman in one single image – not just my favorite shot from any of the Batman features, but my favorite single image of that hero from anywhere in his entire 75 year career. SUMMER OF BLOOD: READERS' CHOICE, REDUX!